The new AIRBUSTER is the ultimate CO2 solution. The CO2 pump consists of an aluminium housing with an integrated pressure control regulator to help user release just the right amount of air. Dust protection cap keeps internals clean. Compatible with 16g and 24g threaded CO2 cartridges, SKS cartridges feature insulation protection. 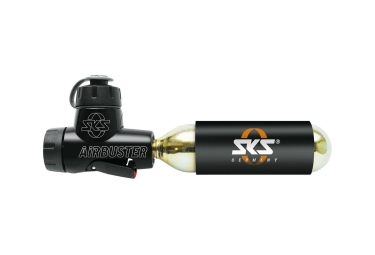 Airbuster includes a replacement 16g cartridge and 2-point pump holder. Incl. water bottle clip.